It’s grim up North in The Eagle, Kevin MacDonald’s epic take on Rosemary Sutcliffe’s classic children’s novel, The Eagle of the Ninth. 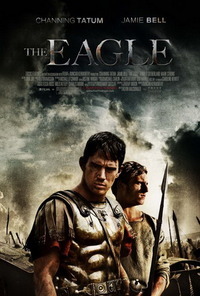 Yet newly minted Centurion Marcus Aquila (Channing Tatum) still requests a command in Britain, an Imperial backwater where he hopes to distinguish himself in battle, thereby regaining the lost honour of his family. The battle, at least, comes fairly quickly. There’s a brief bit of business about hardened legionaries questioning the mettle of the wet-behind-the-ears martinet, but any hints of a Roman-Era Fort Apache (1948) are banished early on, when Marcus excels himself during an attack on the fort and spearheads the rescue of a captured patrol. The real meat of the film only begins when Marcus, recuperating at the villa of his uncle (Donald Sutherland) after his earlier exploits, forms a bond with the British slave, Esca (Jamie Bell), who becomes his companion for the rest of the film. However vivid its historical recreation, however strange its depiction of Northern Britain as an aboriginal wilderness, the film lives or dies on the relationship between Marcus and Esca. If we are to feel any sense of tension during the languors of their protracted search for the 9th Legion’s Eagle Standard then we need to buy into the mutual mistrust which underlies their burgeoning friendship. We have to believe, as Marcus’s uncle warns him, that Esca is willing to slit his throat as soon as they cross Hadrian’s Wall. Yet The Eagle is too chummy, too much of a boys’ club, for there to be any question of betrayal. While we hear of atrocities committed by the Romans, Marcus is too direct and noble to seem complicit in these, and the same holds true for Esca, who is a sanitised, almost sanctified, sort of savage. Although he tells us that he hates everything Marcus stands for, his joy is palpable when they ride together at breakneck speed through the forests, or fight side by side against conveniently anonymous assailants. These scenes may sing, providing some of the most effective action sequences you’re likely to see in a 12A-rated film this year, but they also lead to jarring shifts in tone when The Eagle remembers itself enough to find all this gleeful violence a bit unseemly. The Eagle, rather like Esca, is caught serving two masters. As a rollicking adventure movie set among the rough wilderness of ancient Scotland, it just about delivers. As a moral tale about simple humanity and seeing the other side of the story, it’s hardly worth the journey. This review was published on March 24, 2011.